The world of control and automation using motors, solenoids, lamps and all sorts of other devices has long been restricted to those who can write computer programs. ConText opens up this world to non-programmers (and programmers who want it a bit easier). 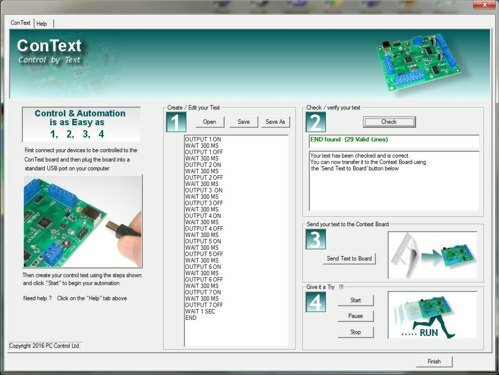 If you can create a simple text file on your computer then you can operate this world of devices and build your own automation system. 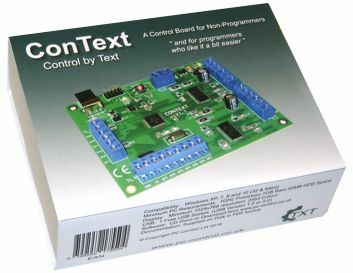 How does ConText perform "Control and Automation"
The ConText board has electronic components which provide for "reading" inputs and controlling outputs and a powerful microcontroller to carry out your desired automation requirements. ConText has two types of input..
- Standard digital type; which means that it will recognise if an input is on or off. This can be from a simple switch or a more complex device which provides a voltage output corresponding to it being on or off. - Analogue type: These offer the possibility of making measurements from sensors such as temperature, light, humidity, pressure etc.. Although the range of sensors is enormous, the most common type provide a voltage output proportional to the property they are measuring. ConText analogue inputs can convert this to a simple number using the built-in 10bit A/D convertor . - Control for DC motors providing speed and direction control for up to 4 such motors. 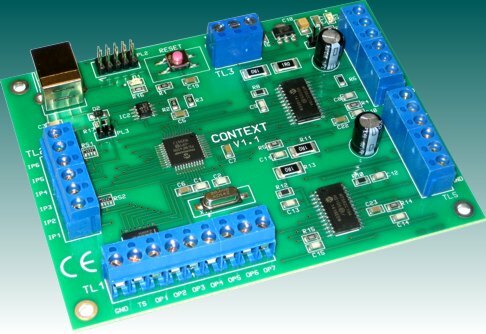 - Control for stepper motors, providing the more complex pattern of pulses that these motors require and leaving you to simply specify how many steps to take in a specific direction at a specific speed. - Control for simple switching type outputs which offer a means of switching on and off external devices of all types. Although the switching outputs are limited to fairly low powered devices, they can be used to operate relays which in turn can then operate almost any power of device. The power and simplicity of ConText really begins to show when it comes to specifying the control requirements for the automation. As previously mentioned, this is a simple text file. It can be created using the "built-in" text editor which is part of the ConText software or any other text editor which doesn't involve fancy formatting or font and colour enhancements, i.e. simple , plain text. A good example is the text editor which comes with all Windows systems called "Notepad". - OUTPUT 2 ON will turn on switching output number 2. - WAIT 10 SEC will wait for 10 seconds before moving on to the next line of text. - DCMOTOR 2 FORWARD will start DC motor number 2 running in the forward direction. Operate entirely independently of the PC computer !!! Just disconnect it from the USB port and give it a power supply (eg battery pack or similar) and press its "Reset" button to begin your automation instructions. You can also run it while still connected to the PC if you want to. The software provided has that feature. It also has additional facilities to allow you to edit and verify your text file. All Windows operating systems since XP already have the appropriate driver installed, so there is nothing more to do. As soon as you connect the board to a USB port, Windows will recognise the board and configure it automatically, ready to use. This applies to Windows XP, Vista, and Windows 7,8 and 10. The software supplied with ConText makes the job of building your control and automation system as easy as 1,2,3,4. 4. Give it a Try !!! Why not give it a try. The software can be downloaded from the link below. Just unzip the zip file and run the "setup" program to install ConText on your PC. It even contains specific help on how to connect your devices (motors, etc...) and sample text to get you started. Obviously it wont actually control anything until a board is attached but it will let you see how simple it is.